The Society of Mary New Zealand is interested in the Ohairu parish project because it presents a certain fit between the Society’s origins and the new-day circumstance. 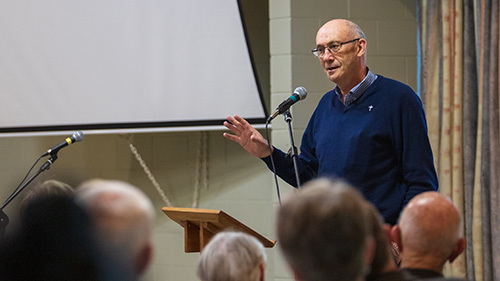 The comment was made by New Zealand provincial, Fr David Kennerley SM, when talking to a 400 strong crowd from the Ohairu parish meeting at the Uniting Church, Dr Taylor Tce, Johnsonville. The meeting was called to explain the new model of parish leadership which the Society has agreed to be part of. Fr Kennerley said that through successive Marist Provincial Chapters the Society has committed itself to working in missionary parishes, and that the Archbishop of Wellington, Cardinal John Dew has identified St Francis Ohairu parish as one of these. Calling the model of mission “a fantastic, comprehensive vision” Fr Kennerley said there is a sense that this new model of parish is leading towards something new. Fr Kennerley indulged the meeting with a short history lesson. 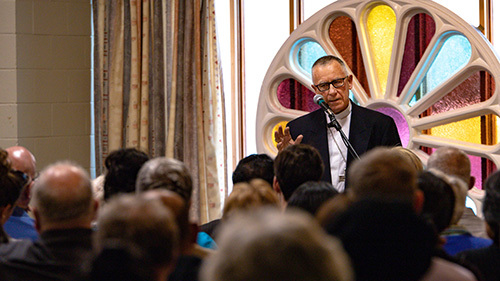 Explaining the Marists came to New Zealand called by laity who had already established the New Zealand Church, “Supporting a new church coming to birth is something that suits us,” he said. However he warned, “We are not the cavalry”. “We are also not here for the long haul”. Clarifying the commitment, he said the Society’s agreement is, for three years to work with a lay-led missionary team. Fr Kennerley’s comments came as a response to Cardinal John Dew’s earlier address. Prior to Christmas, Archbishop John Dew appointed Fr Peter Roe SM as the Parish Administrator to work with the new lay team. “I simply do not have anyone I can appoint as Parish Priest”, he told the meeting. He said new circumstances meant resurrecting an exciting, far reaching plan previously shelved by the parish. Cardinal Dew noted that the concept of lay led parishes is not new. Moving the discussion forwards, from a lack of priests to modern day mission, Cardinal Dew referred to a 100 year old document written by Pope Benedict XV. “If we are not on mission we are not being Catholic”, the former pope wrote. Cardinal Dew reinforced the comment by saying that of nature the Church is missionary. “A church that focusses on itself becomes self-referential”, he said. Responding to questions, Cardinal Dew said the topic of married priests was on the agenda in Rome, and while progressing the possibility takes time, he remains hopeful the issue will come up again later in the year. Meanwhile, the cardinal encouraged the parish to think of what it can do itself. “The Church is no longer priest-centred, the priest doesn’t have to do everything. “The question for each of us is what contribution can I make”? Questioned on how he will judge the success of this new team leadership model, the Cardinal was quick to respond, “As I do any activity of the Archdiocese”. Numbers attending Mass St Mary of the Angels have dropped slightly while the church is closed for earthquake strengthening, yet the parish continues to reach out. With Sunday Mass now celebrated at four venues, the parish is making an effort to engage with students. Located in the heart of central Wellington, St Mary of the Angels’ parish is a spiritual home to five university hostels and numerous student flats. Known for its student-friendly liturgy, particularly at the 5:00pm Sunday Mass, this Mass continues albeit on the other side of the city. “Moving across town puts additional pressure on students; it’s a bit harder to get there,” says Parish Priest, Fr Barry Scannell. “Like us, the students are looking forward to coming back home to St Mary St Mary of the Angels at Easter next year”. While primarily a liturgical and devotional centre, St Mary of the Angels also has three groups that appeal to students. 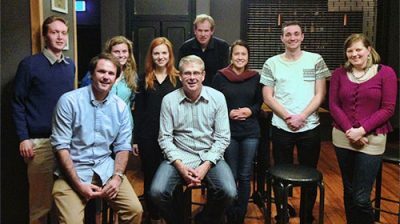 Theology on Tap is a monthly event hosted by the St Mary of the Angels’ young adults group. A familiar format to those used by other theology on tap groups, meetings are held in a nearby pub. Theology on Tap at St Mary of the Angels has been going for about 5 years. “It’s a chance to meet other and learn about our Catholic faith”, says regular attender, Jane Ellis. She enjoys the variety of speakers; local Catholic politicians, pro-life leaders and Catholic educators. The most recent speaker was Mons Gerard Burns, Vicar General of the Archdiocese of Wellington, Vicar for Māori and executive board member of Caritas Internationalis. Vicky Wall is a member of another group for young adults, “The Monday Night” group. She says the group meets weekly to read and discuss a document relevant and important to how we live. Calling it a springboard to interact, share and pray with our friends, the group has just finished focussing on “Amoris Letitia”. “The biggest challenge using Amoris Letitia has been that none of us are married. “The group got by using examples of our own childhood families”, said Vicky Wall. Having completed Amoris Letitia the group is now thinking of what they would like to read next. SMAYAC’s is another youth group in the St Mary of the Angels’ parish. It meets on the first and third Thursday of each month. On the first Thursday the focus is spending some quiet time with God and resting in his presence in the Blessed Sacrament. Each of the group takes turns to organise the time which varies from silence, reflecting, praying and sometimes even Taize singing. The third Thursday’s meetings are spent reflecting on the upcoming Sunday’s gospel. As an aid to their reflection the group uses Lectio Divina to meditate, pray and commune with God through His Word. Sharing, a hymn and a time dedicated to prayers of intercession are all important components to the SMYAC meeting. Fr Joe Savesi is no stranger to telling a joke to help illustrate a point, but a sung sermon! Yes, the central city curate at St Mary of the Angels, last Sunday, sang part of his homily! “Telling a joke, now singing the sermon are both ways of making sure people remember the point”, said a parishioner after the 9am Mass. “They catch people’s attention and underline his main points”, she said. Traffic congestion in Wellington city is adding to the price-tag of the donation-funded St Mary of the Angels earthquake strengthening. It is the view of St Mary’s Parish Priest, Fr Barry Scannell who made the comment in Wellington’s Dominion Post newspaper. Fr Scannell’s comment came in response to complaints that four major construction projects in Boulcott St are contributing to significant congestion in the city. Fr Scannell claims that St Mary’s is a ‘good citizen’ and he disputes that work on the inner-city church is adding to the congestion. With excellent project management at St Mary of the Angels, most of the work is off the street. The parish has also purchased five parking spaces. “The church paid $800 a week to the council to hire five parking spaces off the road where trucks and work vehicles could park, and unload materials,” he told Joel Maxwell of the DomPost. Other work on Boulcott St includes a revamp of the old Dominion Post building, seismic strengthening of the Majestic Centre and construction of an eight-storey apartment building. Helen Moate, of McKee Fehl, project manager for the revamp of the former Dominion Post building, said the company worked with the council on a plan for dealing with congestion on Boulcott St.
A spokeswoman for the apartment development said also said the construction was covered by the traffic management plan submitted to the council, adding their building would be finished in a few weeks’ time. The DomPost was unable to reach the Majestic Centre owner Kiwi Property for comment. Wellington City Council spokeswoman Victoria Barton-Chapple said the Council there were traffic plans in place but the Council had no control over the completion of the projects. Cardinal John Dew, the Archbishop of Wellington, has announced that as from 1 February 2016, the Archdiocese will take responsibility for the pastoral care of the parish of Saints Mary and Joseph in Otaki and Levin. Dew has thanked the priests and brothers of the Society of Mary for their pastoral care and leadership in Otaki which the Society of Mary has provided almost continuously since 1844. 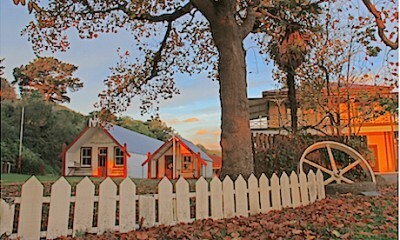 The Society only recently took up care of the larger new parish of Sts Mary and Joseph, which combines both Otaki and Levin. But because of the ageing of its priests and brothers the Society of Mary has found it can no longer provide a religious community to minister to the pastoral care for the parish. “Given the long history of the Marist presence in this area, this move is not something that we have approached lightly or rashly,” said Father David Kennerley, the provincial of the Society of Mary. Society of Mary will continue to offer its assistance to the parish and the greater Wellington area in Maori Pastoral Care. Mix one cherry picker, a real sense of adventure and top it with a of love for people, and doors open for Marist priest, Michael Mahoney. 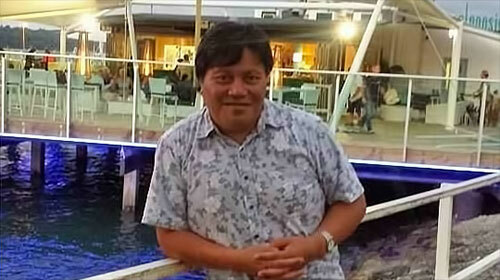 The missionary priest who spent 30 years in vibrant Brazil, continues his adventure with the Gospel, but now works in New Zealand’s remote rural South Westland. For Michael Mahoney, the cherry picker is not only a practical help to maintain several South Westland church buildings, but is an extension of his ministry. “What I’m doing is a service to the parishioners. People say to me ‘will you clean my chimney or top a tree”, Fr Mahoney told the Hokitika Guardian. 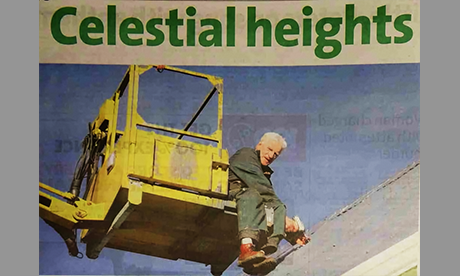 Owned by the parish, use of the cherry picker and Fr Mahoney’s help are not a “Catholics only domain,’ and both priest and machine came into their own last April helping the community in the aftermath of Cyclone Ita. “People know what the priest represents and who he is; so if he is able to offer assistance to people in their lives it is a means of affirming Christianity”, said Fr Mahoney. An accomplished pianist and composer, parents have also asked Fr Mahoney to teach music to their children. As services are gradually removed from rural areas, Fr Mahoney believes it is important for the Church to show it cares for country people; affirming their way of life, providing a spiritual presence and moving around in the community. The parish too gets its fair share of use from the cherry picker and recently Fr Mahoney dealt with the ageing corrugated iron roof of the Hari Hari church for the grand cost of $150. Calling it a “fix-up job” Fr Mahoney says getting a plumber in would have cost thousands of dollars; money the parish does not have. Fr Mahoney’s energy and concern has not gone unnoticed, and parishioner, Mrs Jincey Wright, told the Hokitika Guardian that Fr Mahoney’s work was a tribute to his tenacity and commitment to the people. It is amazing how so much can be achieved with so little, she said.